Digital networked technologies have become an increasingly integral part of human activity, shaping and being shaped by individual and collective lives. Across the world, networked economies increasingly position new technologies as key to effective governance, education, growth and the preparation of a future work force. Many countries in the global South are adopting policies and domestic strategies that seek to embed and integrate networked technologies as an essential part of everyday life (Toyama 2013). In this frame, technologies are held to ‘powerfully contribute to the worldwide democratisation, civic engagement and action-orientated social responsibility’ (Benson and Harkavy 2002). Policy developments such as the Convention on the Rights of Persons with Disabilities stress the role of technology in enabling people with disabilities, putting the accessibility of digital tools and services at the centre of government policies. Yet, a move beyond the habitual exoticisation of technology and its assumed benefits is important. The claims made for technology as a route to social justice have not been substantiated (Selwyn 2013). In this chapter we examine not only the narratives that dominate mainstream understandings of technology and ‘digital divides’ but also the morenuanced debates in areas deemed most relevant to disabled people. We structure our account to recognise the lifecycle of mobile and networked devices, from (re)sourcing through to manufacture, usage, maintenance, disposal and governance. We do not intend to deny technology’s positive impacts; we seek to highlight silences in technology and disability discourse —disabled experiences that are missing— occluded by the arrangement of social, geopolitical, economic and cultural forces that shape our technologies and day-to-day life across the world. Apple. (2014a). Apple supplier responsibility 2014: Progress report. Retrieved April 16, 2014, from http://images.apple.com/supplierresponsibility/pdf/Apple_SR_2014_Progress_Report.pdf. Basel Action Network. (2002). Exporting harm: The high tech trashing of Asia. Retrieved November 5, 2014, from http://www.ban.org/E-waste/technotrashfinalcomp.pdf. Basel Action Network. (2005). The digital dump: Exporting re-use and abuse to Africa. Retrieved November 5, 2014, from http://ban.org/library/TheDigitalDump.pdf. CNET. (2012). Riots, suicides, and other issues in Foxconn’s iPhone factories. Retrieved October 17, 2013, from http://www.cnet.com/uk/news/riots-suicides-and-other-issues-in-foxconns-iphone-factories/. Duhigg, C., & Barboza, D. (2012, January 25). In China, human costs are built into an iPad. The New York Times. Retrieved January 30, 2015, from http://www.nytimes.com/2012/01/26/business/ieconomy-apples-ipad-and-the-human-costs-for-workers-in-china.html. Fair Labor Association. (2012). Foxconn investigation report. Retrieved April 22, 2014, from http://www.fairlabor.org/report/foxconn-investigation-report. Finkelstein, V. (1980). Attitudes and disabled people: Issues for discussion. Disability Archive UK. Retrieved October 17, 2013, from http://disability-studies.leeds.ac.uk/files/library/finkelstein-attitudes.pdf. Hargittai, E. (2002). Second-level digital divide: Differences in people’s online skills. First Monday, 7(4). Retrieved from http://dx.doi.org/10.5210/fm.v7i4.942. Katsui, H. (2006). 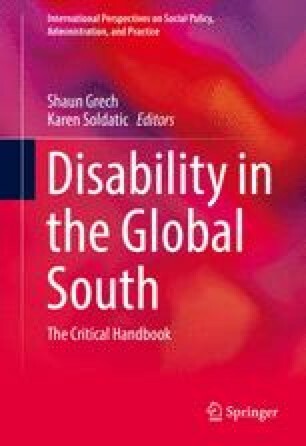 Human rights of disabled people in the South. English edition. Retrieved October 17, 2013, from http://disability-studies.leeds.ac.uk/files/library/katsui-article-for-Antti-2.pdf. (Originally published in Finnish as Vammaisten Ihmisoikeuksista Etelässä. In A. Teittinen (Ed. ), Vammaisuuden Tutkimus, Yliopistopaino. Helsinki. 86–119. Kelly, B., Hassell, J., Sloan, D., Lukeš, D., Draffan, E. A. & Lewthwaite, S. (2013). Bring your own policy: Why accessibility standards need to be contextually aware. Ariadne 71. Retrieved April 23, 2014, from http://www.ariadne.ac.uk/issue71/kelly-et-al. Lewthwaite, S. (2011). Disability 2.0: Student dis/connections. A study of student experiences of disability and social networks on campus in higher education. PhD thesis, University of Nottingham. Retrieved August 14, 2014, from http://etheses.nottingham.ac.uk/2406/. Loney, M. & Lemos, R (2004). Study: Unpatched PCs compromised in 20 minutes. Retrieved November 30, 2014, from http://www.drordi.com/articles/unpatched_pc_s_compromised_in_20_minutes.pdf. Operation Giving. (2014). Donate excess inventory. Retrieved November 5, 2014, from http://operationgive.org/index.php/donate/donate-excess-inventory/. Rush, J. (2014, 3 April). Think your television is recycled when you get rid of it? Daily Mail. Retrieved November 5, 2014, from http://www.dailymail.co.uk/news/article-2595966/Think-television-recycled-rid-This-likely-end-dumping-grounds-one-dubbed-worlds-biggest-e-waste-site.html. SACOM. (2013, December 17). No more iSlave on cover glass—Biel Crystal pledge to improve labour basic condition. Retrieved January 30, 2015, from http://sacom.hk/bielcrystalpledge/. Toyama, K. (2010b). The myth of scale. TEDxTokyo—Kentaro Toyama—05/15/10—(English). Retrieved April 20, 2014, from http://tedxtalks.ted.com/video/TEDxTokyo-Kentaro-Toyama-051510. Toyama, K. (2013). Which comes first? Social media or social development. Keynote presented at the IDIP International Annual Symposium. Retrieved November 30, 2014, from http://groupspaces.com/ipid/item/420051. UN. (2006). Convention on the rights of persons with disabilities. Retrieved April 22, 2014, from http://www.un.org/disabilities/default.asp?navid=12&pid=150. We Are Social. (2014). Global digital statistics, 2014. Retrieved April 8, 2014, from http://wearesocial.net/blog/2014/01/social-digital-mobile-worldwide-2014/.